You are viewing the archive pet food ratings. Follow the link to view the current pet food ratings. 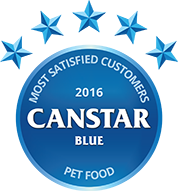 Finding food that your pet will love has never been easier using Canstar Blue’s customer satisfaction ratings. Canstar Blue research finalised in June 2016, published in July 2016. Canstar Blue is pleased to announce that Jimbo’s was rated 5 stars in overall satisfaction and has received our inaugural NZ award for Most Satisfied Customers – Pet food 2016. Pets are a member of the family – we want what’s best for them, and that means ensuring they maintain a healthy diet. That said, there’s no point in buying pet food if your pets won’t eat it – it needs to be tasty. In fact, to make sure pets won’t get bored of their food, nearly one-quarter (24%) of pet owners say they will change up what they feed them. Yet we’re usually left a little in the dark when it comes to trying new pet food brands – there’s no way to know exactly what you’re getting or whether your pet will like it. To help take some of the guess work out of buying pet food, Canstar Blue asked owners across New Zealand what they thought about major pet food brands and how much their furry friends seem to enjoy it. The results of this survey saw most brands performing very well, although one brand stood above the rest. Canstar Blue is pleased to announce that Jimbo’s was rated 5 stars in overall satisfaction and has received our inaugural NZ award for Most Satisfied Customers – Pet food 2016. Jimbo’s offers a range of natural and meaty pet food options for dogs and cats. All its products are raw which Jimbo’s claims is beneficial for animal wellbeing. Additionally, the company says its meat is 100% New Zealand sourced. Those New Zealanders that own pets certainly treat them well, with 40% of survey respondents admitting that their pet sleeps in their bed with them, with the results consistent across all generations. And with nearly half (47%) of the survey respondents owning more than one pet, the bed could be rather crowded! 53% of survey respondents also admit that they give their pets treats on top of their regular meals, with Baby Boomers (58%) the most soft-hearted. A lucky (?) 6% of pets even eat straight from their owners’ plates. Owning a pet is a commitment – a promise to look after it. Fortunately, Canstar Blue’s research suggests New Zealanders do just that, with the majority of survey respondents holding themselves out as responsible pet owners. One potentially concerning finding, though, is that only 62% of survey respondents say their pet’s vaccinations are up to date, dropping to 50% with pet owners in The Bay of Plenty. Canstar Blue commissioned I-view to survey 2,500 New Zealand consumers across a range of categories to measure and track customer satisfaction. The outcomes reported are the results from customers within the survey group who have purchased food for their pet in the last 3 months – in this case, 1,474 New Zealanders.